This week’s blogging marathon theme is Combo Meals. The first dish that I am preparing is the Rava kichadi along with coconut chutney. 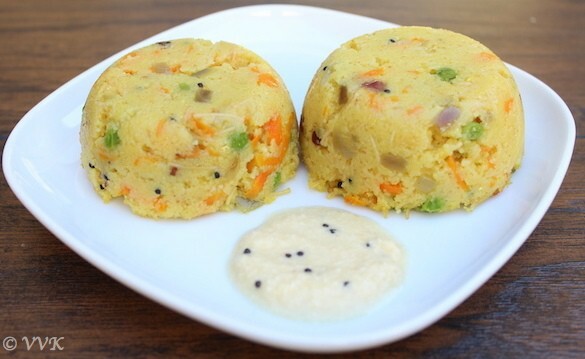 I love upma and kichadi. 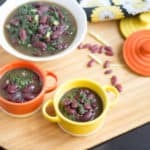 It is a one pot comfortable meal which can be prepared quickly. 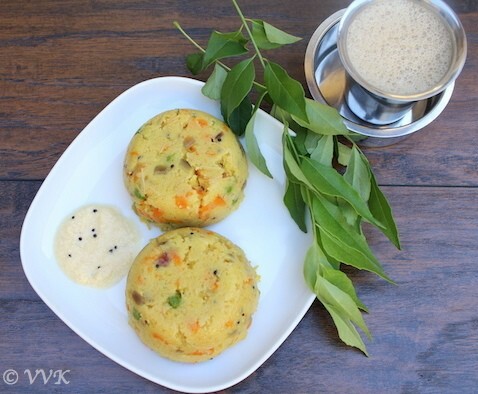 Upma is a generic term and we explicitly say rava upma, cracked wheat upma or semiya upma. 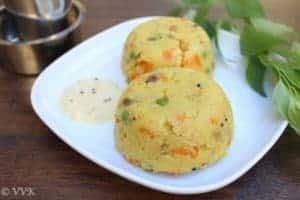 Kichadi is prepared with sooji and semiya (in lesser quantity) and it is also loaded with veggies. (Not to confuse with the North Indian Style Kichadi) I am a big fan of Saravana Bhavan’s Rava Kichadi. Yummmm. I usually order Rava Kichadi every time I go there. Also, I like the kichadi they serve in weddings. 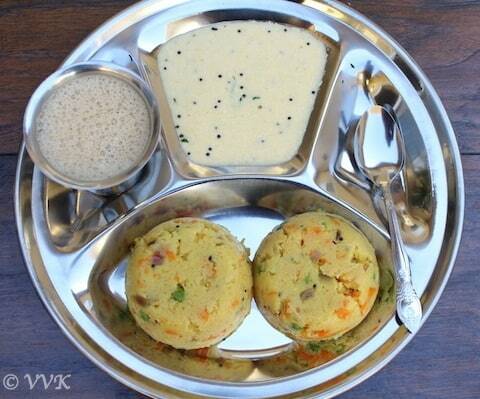 Rava kichadi and kesari are one of the staple tiffins in Tam-Bram weddings. Dry roast the semiya and rava till they turn light brown. 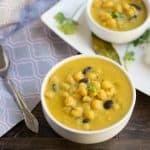 Once the oil is hot, add mustard seeds, urad dhal, channa dhal, and hing. As they start to splutter, add the chopped green chilies and sauté for a minute. Now add the chopped onions and cook till they are translucent. Now add the veggies (carrots and peas), salt and turmeric. Cook them for 5 minutes. Once the water starts to boil, add the roasted rava-semiya. The key here is to mix while adding them so as to avoid any lumps. Cover and cook for 2 minutes and then remove the lid and cook for 2 minutes. Add the chopped cilantro and that’s it, yummy kichadi is ready. Adjust the green chilies and salt according to your preference. 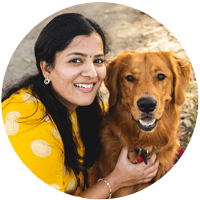 If you don’t have semiya, you can skip or add rava and semiya in 1:1 ratio. Also, add veggies of your choice. You can find the chutney recipe here. 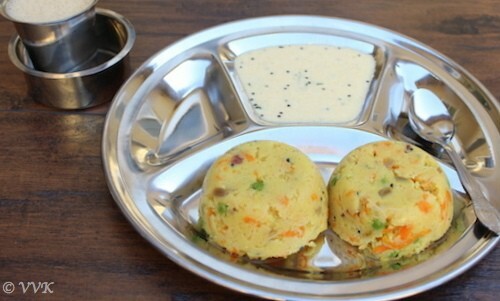 Rava Kichadi is one of the popular tiffin items commonly served with coconut chutney. It is prepared with rava, vermicelli and vegetables. 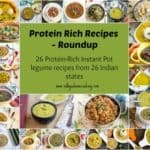 Once the oil is hot, add mustard seeds, urad dhal, channa dhal and hing. As they start to splutter, add the chopped green chillies and sauté for a minute. Now add the veggies (carrots and peas) , salt and turmeric. Cook them for 5 minutes. Add the chopped cilantro and thats it, yummy kichadi is ready. Also add veggies of your choice. This is one combo which is difficult to resist!! I like to add Semya to rava Khichdi too. Yours looks colorful and delicious. 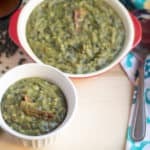 Khichadi and chutney used to be our standard Saturday dinner…:)..though I used to make groundnut chutney..the version you made sounds delish! A classic combo , khicidi looks so tempting dear !! 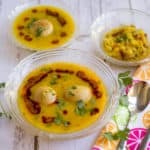 Who can resist to this beautiful kichadi and chutney, such a filling breakfast. Cannot beat this combo! so classic and mouthwatering. Khichadi with all those vegetables looks so colorful. Perfect with the coconut chutney.